While The Godfather romanticized the American Mafia in the early 1970s, Kinji Fukasaku's five-film series known as The Yakuza Papers: Battles Without Honor & Humanity revolutionized the Japanese yakuza film with unprecedented intensity. A post-World War II epic that broke Japanese box-office records, this complex, utterly authentic cycle of gangster films replaced the popular ninkyo or "chivalry" films of the '60s with jitsuroku, an entirely new breed of gangster film that rose from the ashes of Hiroshima and post-war reconstruction, depicting a meticulously detailed "alternate history" (as Japanese film expert Tom Mes observes in the accompanying booklet) that had been ignored by the "official" factual record. Beginning with 1973's Battles Without Honor and Humanity and continuing through four hugely popular sequels, these are bracingly intricate studies in shifting loyalties and gangland chaos, tracking the yakuza career of Shozu Hirono (played by charismatic star Bunta Suguwara), who rises from lowly soldier status in 1946 to "sworn brotherhood" and respected retirement in 1970. Across this quarter-century of death, power, and betrayal, Fukasaku orchestrates nearly 50 characters in four major cities, all vying for dominance in a familial structure so complex that a helpful flow-chart is provided to follow the shifting balance of power. 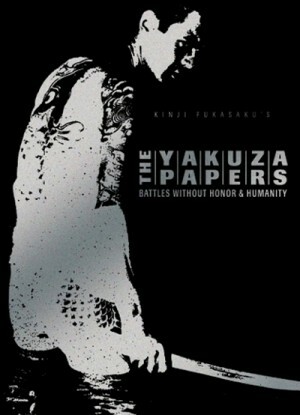 Western viewers may struggle with the social context of these films, but as a gangster epic of escalating scope and power, The Yakuza Papers offers a universally energizing DVD experience. Fukasaku (who died in January 2003 while filming his 62nd film, Battle Royale II) was a master of cinematic pulp, and these films represent the pinnacle of his frenetic, deliberately chaotic hand-held camera style, which strongly influenced American urban crime films of the '70s (as French Connection director William Friedkin notes on the feature-packed supplement disc). Rough-edged and thematically rich, the five films presented here--all in pristine digital transfers and brilliantly translated by ace subtitler Linda Hoaglund--combine to form a sprawling milestone of Japanese cinema. Home Vision's packaging and comprehensive supplements pay honorable tribute to Fukasaku's achievement, with bonus features that provide all the necessary background needed to fully appreciate The Yakuza Papers as a raw, ambitious masterpiece that fully deserves its widespread acclaim. Can you re-up this? Thanks a lot.